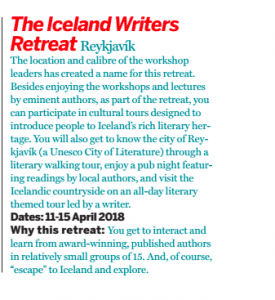 Iceland Writers Retreat in BusinessWorld India! B usinessWorld India has published their Luxury 2017 edition and named Iceland Writers Retreat as one of their favourite “writing paradises.” They cited our distinguished faculty, small workshopping group sizes, and the opportunity to explore Iceland. Read more in their article, The Writerly Life, by poet and editor Jonaki Ray.